Kwandwe Private Game Reserve lies in the heart of South Africa's malaria-free Eastern Cape near Grahamstown, and is a natural conclusion to a journey along the world-famous Garden Route. Kwandwe aptly means "Place of the Blue Crane" in Xhosa (South Africa's highly endangered national bird) and is home to a population of these rare birds. It offers an exceptional safari experience in a region steeped in history and culture. The Great Fish River was a hotly contested border during the Frontier Wars of 1779 to 1878 between the Xhosa nation, Dutch farmers and the 1820 Settlers from England. Kwandwe's reception building is a Frontier War-era fortified homestead, and the Reserve boasts its own intimate chapel. Kwandwe Private Game Reserve features the exclusive Main Lodge, unique historic Uplands Homestead and Ecca Lodge, all offering world-class sophistication and style in the African bush. Set along the aloe-studded banks of the Great Fish River, nine suites feature private plunge pools and spacious thatched game viewing decks with magnificent views of the wild yet gentle landscape. Stylishly furnished in Frontier Settler style, integrating local African culture with colonial settler history, the elegant thatched stone and glass suites feature floor-to-ceiling doors which fold back to reveal uninterrupted wilderness vistas. 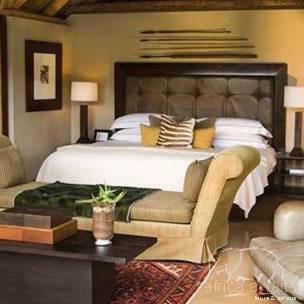 Guest areas have a large fireplace with massive stone chimney, and a soaring thatched roof with imposing chandeliers. Sophisticated, glass-fronted sitting and dining areas boast expansive viewing decks with breathtaking river views. Delicious Pan-African cuisine is served on the private decks, in the candlelit dining room, or enjoyed in the boma (outdoor dining area). This gracious homestead is a sensitively restored 1905 farmhouse comprising three spacious en suite bedrooms with private terraces – available for sole use by guests. Uplands Homestead has a large swimming pool and gazebo, and guests enjoy their own private ranger, tracker, chef and open 4x4 safari vehicle. It is situated far from Main Lodge in a tranquil valley and combines modern touches with 1820 Settler décor and classic architecture. The sitting and dining areas feature high ceilings, wooden floors and beautiful fireplaces. In the modernised farm kitchen, Uplands Homestead's private chef prepares delicious Pan-African cuisine and local specialities. 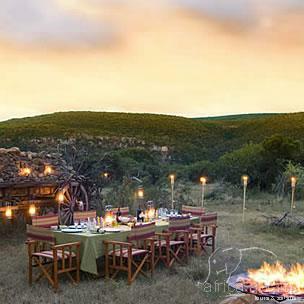 Nothing beats a true bush banquet in a surprise setting under the magical African sky. Innovative, stylish and intimate, Kwandwe Ecca Lodge embodies a “funk-meets-futuristic-farmhouse” ambience, and features just six intimate suites, each with an en suite bathroom with plate glass-enclosed shower, bath, w.c and twin hand-basins, as well as a sitting area which can comfortably convert into accommodation for children 11 years and younger. Overlooking rolling spekboom valleys, main guest areas include a spacious sitting room, dining room and bar area, interactive kitchen, sparkling rim-flow lap pool and interpretive centre. 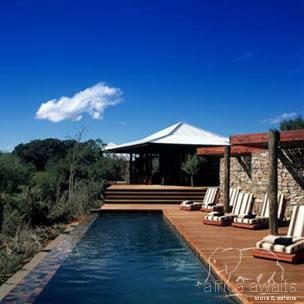 The ‘fun member' of the Kwandwe family, Ecca Lodge is constructed of stone gabion walls and corrugated iron. Nestled into a gently sloping, densely vegetated hillside, the Lodge is airy and open with barely a barrier between indoors and the African bushveld. With your holiday, safari or business trip from in to Kwandwe Private Game Reserve in Eastern Cape.